Clicking on something inside the advertisements helps even more!! This article's photos show the sidecar rig mostly as it looked when I purchased it from Al Olme of Minneapolis, Minnesota. There is a link, near the bottom of this article, directing you to a much more extensive article, with photos of the bike as it mostly looks today. That article is EXTENSIVE with technical help/advice; and, contains original EML brochures, ETC. This sidecar rig was purchased by me in November of 2005, and I had DailyDirect (AKA Haul Bikes) ship it to me in California. Over a number of years since, I have done MANY personal modifications. The ABS system was completely removed except for the front wheel toothed ring, which I will remove at the next front tire change, the braking system was also modified somewhat. A completely overhauled larger output alternator was installed, tested at 84 amperes! Every electrical connection in the rig was gone over. The instrument pod was modified for change the 24 hour display to 12 hour display and the calibration of the speedometer was adjusted to agree with a GPS for the existing car type tire size; as the speedometer had read very much faster than the rig was going, due to the much smaller diameter rear tire compared to a stock rear M/C tire. The odometer reads ~12% fast (not considered easily fixable, as there is no adjustment for the odometer). I built a very high quality top for the chair, which seems to be, as I hoped, 100% weatherproof. The Bulb Monitoring relay box was modified. Various lights modified. The full list of modifications would be very long. 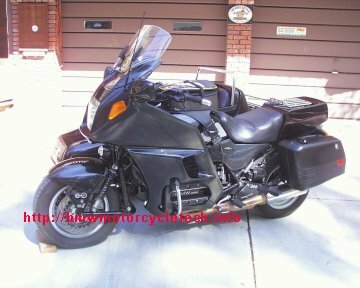 The 1993 K1100LT was June 1992-built. 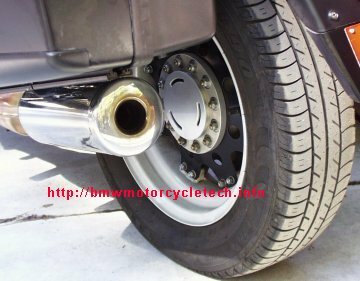 I am aware that a BMW bike built in June 1992 should be a 1992 model, per BMW normal habits. BMW doesn't always do things by their own book. BMW never made an official 1992 model year K1100LT. When I purchased the bike it came with a Police (Authorities) type rear case and a seat to match. I have since installed the stock non-authorities items, and sold the Authorities items. There are two fog lights under the fairing nose. I've put full electrics to the sidecar interior. Hydraulic brake on sidecar hydraulically linked to the bike rear brake master cylinder, which is a larger 16 mm size & I changed that cylinder and some minor details items. The photo does not show removal of the ABS nor some other modifications made since the photo was taken. Tug is equipped with car tires on 14" EZS rims. I installed a digital voltmeter, additional rear lights of various sorts, and many other modifications. The inside of the sidecar and its trunk I lined with hotel-quality rugs. Some other items, such as the higher roll bar and taller windshield, both for the sidecar, and my custom home-made chair top; are not in these photos. I also have the City Cases. Like Al Olme, I think the tug looked better with the Authorities rear case, and its capacity was fairly decent in relation to the Tour Trunk; but I needed the extra room the tour trunk provided for long distance touring with my wife. The leading link fork with floating brake calipers; sub-frame, wheels, etc., are all by EZS. The front and rear rims are 4.5 JJ 14, originally shod with Firestone F590 tires in size 165/70-R14. The REAR tire is now a 175 or a 165, I have tried both, probably will settle on the 165 both front and rear. Both 175 and 165 will fit and work well at the rear, but the front fender will require mounting changes to accommodate a 175, to allow for reasonable mud-buildup on muddy roads ...and I have not, yet, wanted to do that. I have opened and personally reworked the front steering damper and also the two front shock absorber units; and, the EML shock unit. The sidecar wheel is an EML 300 DX-15, shod with a 135 R15 tire. The rig came to me painted in the stock BMW color scheme 162, Classic Black Metallic (code 679). Note the saddle & Police trunk; these, the bracketry, etc., were removed & sold. I did not need them, but the look was nice. The above photo shows the short rollbar, which I removed & installed a taller one for use with the new top I made. 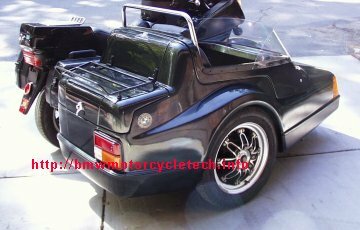 That allows a real adult sized person to ride in the sidecar, and the appearance with the top is much nicer. The full-size tour saddlebags are left off now and then when not needed, but commonly I leave the left one on, and on the right I use the City case, as it is easier to R/R. Now and then I use both City cases. Only on a long tour with need for added capacity would I use both Tour cases. In the photo the right side tour case seems to be touching the sidecar, but that is not so. 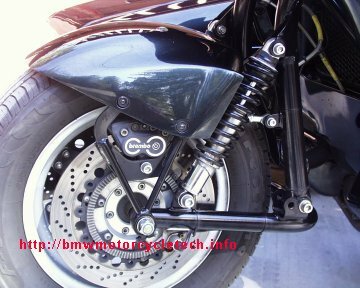 There is an extensive technical article on this website regarding brakes, suspension, etc., on the EML GT2 sidecar (both early and later one hinge models). 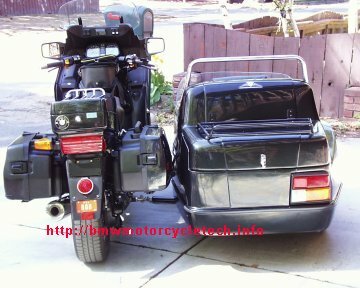 http://bmwmotorcycletech.info/EMLsidecar8.htm. That article also contains photos of the rig with the top I built, and other changes. The article opens with an original view of an EML brochure for all their models in that era. 10/07/2012: Add QR code; add language button; update Google Ad-Sense code. 03/05/2016: Update meta-codes, justify left, clean up some. 08/10/2016: Update meta-codes, scripts, H.L., layout. Update content. Fix wrong link for T-A-L.
02/06/2018: Clean up html code some. Add 10pxl margins.